No. 7 Virginia Tech was never in the game on Tuesday night in Charlottesville, falling to No. 1 UVA 81-59. The Hokies dropped to 14-2 overall and 3-1 in the ACC with the loss, while the Hoos improved to 16-0 overall and 4-0 in the ACC. They are now 47-3 in their last 50 games, as the program continues to hit its stride. UVA is noted for their team defense under head coach Tony Bennett, but they entered Tuesday’s games as one of the nation’s best offensive teams as well. They came into the game ranked No. 2 in Ken Pomeroy’s adjusted offensive efficiency, and they showed why on Tuesday, busting out to a 44-22 halftime lead and never looking back. Virginia Tech was 19-of-44 (43.2%) from the field, 7-of-21 (33.3%) from three-point range and 14-of-17 (82.4%) from the free throw line. In last season’s overtime win at UVA, their numbers were very similar: 22-of-51 (43.1%) from the field and 11-of-29 (37.9%) from three-point range. They scored 49 points in regulation last year before going on to win in overtime, and they scored 59 points this year in regulation. However, the difference was how much more potent the Hoos are offensively this season. UVA shot the lights out from the outside in the first half, going 10-of-14 (71.4%) from three-point range. Their shooting dropped off a bit in the second half, but not nearly enough to make a difference. For the game, they were 58.5% from the field and 13-of-24 (54.2%) from three-point range. That’s a stark contrast from last year’s Virginia Tech victory in Charlottesville when Virginia went 11-of-38 (28.9%) from beyond the three-point line. Projected first round pick De’Andre Hunter had 21 points and five rebounds for the Hoos. 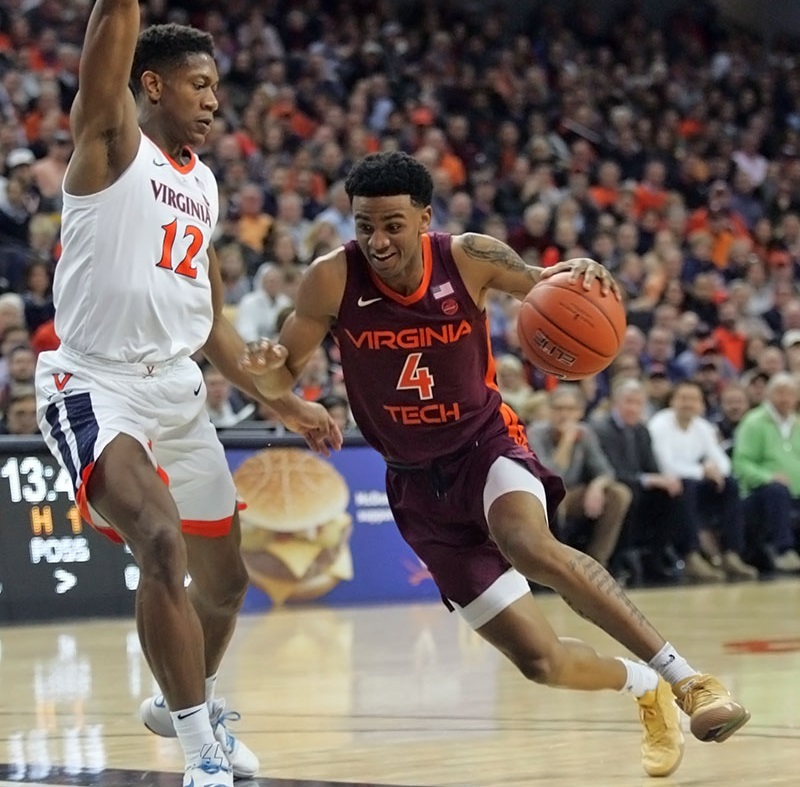 Virginia Tech’s projected first round pick, Nickeil Alexander-Walker, was one of just two Hokies in double figures. He had 19 points on 6-of-10 shooting, he was 2-of-3 from the outside, and 5-of-7 from the free throw line. Ahmed Hill added 14 points on 5-of-12 shooting. However, those two guys didn’t get much help on the offensive end from their teammates. Kerry Blackshear played 28 minutes, but he was in foul trouble for much of the game and finished with just six points. Justin Robinson had only nine points, and after he was whistled for a technical foul with 9:31 remaining, Buzz Williams benched him for the remainder of the game. Ty Jerome had 14 points and 11 assists for UVA, while Kyle Guy added 15 points. Perhaps the story that sums up the game is that of freshman guard Kihei Clark. Clark came into the game with just six made three-pointers on the season, but he nailed three of them in 30 minutes against the Hokies, including one from the corner just before halftime to give the home team even more momentum heading into the intermission. It was at typical start to a conference game for the Hoos, who have held at least a 22-point lead in all four of their ACC games this season. Meanwhile, the Hokies have started slow in all four of their conference games, and that’s a problem that will need to be corrected as they get deeper into ACC play. Virginia Tech will return to action this Saturday when they host Wake Forest (8-8, 1-3). The Demon Deacons are 0-4 on the road this season, while the Hokies are 9-0 at home. Tipoff is scheduled for 4pm, and the game will be televised by RSN. Check your local listings. I’d bet uva played their best game of the year last night. 80% from 3 in the first half, good defense and they’re up by 22. I doubt it would have made a difference if we played our best game. We’ve got another chance to find out…GO HOKIES!!! Obviously our 3pt shooting was major factor in last night’s game but other categories were not awful. Given UVA’s talent and depth and hitting on all cylinders from the opening tip-off is going to be difficult for just about any other team to beat them in that type of mode! As much as it pains me to admit it, I think UVA has very legitimate shot at winning the National Championship this season. I think we have our best team ever and with a few bounces going our way I could see us making to Sweet 16 and any chance past that would have to be us playing on fire like UVA did last night! We got our lunch handed to us last January too and we came back to win in February. That said, uva is a very good and deep team. According to Buzz, Bede is his best lockdown defender. I didn’t see him stop anybody last night. He brings nothing offensively. Outlaw should be be getting most of Bede’s minutes. Bede shoots 43% from 3-point range. Look at the last five opponents and see how few points Bede scored. With the exception of the MES game it wouldn’t make any difference if he was shooting 100 percent for threes. The problem was that Bede was matched up on Guy most of the time, especially in the 1st half. Guy was a non-factor in the 1st half. Unfortunately Robinson got owned and it was Jerome who destroyed us (from the field and because he basically was allowed to get anywhere on the floor that he wanted with the ball, which forced help over an over again, and gave him 10 easy assists before halftime). UVa shot lights-out. We played even in 2nd half but down 22 is hard to overcome. UVa is very good, their bench out scored us 23 to 11, will be similar to future results since we have such a short bench. Oh well, was nice to be ranked in top 15; however, with only one big, inconsistent shooting will be interesting to see where we are come March. I would not bet on top 25. Yesterday’s gone, time to move on! I don’t think we’ll see JR get a “T” in that situation again. Think the bench time will make him mentally tougher the rest of the season. It is one game. It is unrealistic to run the table in ACC play particularly on the road. I am more interested in how the team responds in their next game. They are good. Will be interesting to see how they handle the pressure come tournament time when all anyone will talk about is their past failings with good/great teams…and UMBC. Our shooting was much better than the GT game but still not great (43%/33%) and certainly not high enough to compete with a top tier team. We’re still getting good shots and playing hard on defense (until the last few minutes of the game). Lack of size hurt some last night. It looks like the greatness of our season will hinge on our outside shooting which has been all over the place in ACC play. I think many of us thought that if our shooting was off we could score driving to the basket but we have not been able to do enough of that to overcome poor an off-shooting night. JR gets open 3s because they have to respect his drive but he just can’t hit enough of them. We were averaging 57 pts in our two road games and we scored 59 last night. Hopefully, that’s a pattern we can break. What defense? We played very poor defense against a very good offense. We gave open 3’s all night, that needs to be corrected immediately if we want to have a chance to win. It’s a long season and I hope we can improve. 5 needs to start playing like he did last season! If your opponent passes well and can shoot quickly from far out it’s almost impossible to keep everyone covered up unless you play man to man and then there are other struggles. Maybe in our aggressiveness to pressure the person with the ball we left the wrong people with some space to shoot. I saw one message boarder suggest we stop doubling. Maybe that would have helped. I guess we were hoping that pressure on the ball would cause poor passes and poor shots. But, last night they didn’t seem to be bothered by that. Watched the game on my computer here in Austin. Sort of amazing that no network picked up a “top-ten” match but probably best that the nation could not see the complete dominance of UVA. I was impressed with almost every facet of their game .. .lock-down defense, great passing, crazy (80% for most of the game when it counted) three point shooting. Probably their high point of the year, but just terrific. Of course if their three % was normal, and the Hokies’ was as well, we would have had a close(r) game. But not this evening. Based on that one game, the Hoos have a real national championship caliber team, and it underscores the fundamental limitation of VT’s size against the best. But the next game, in B-Burg could be totally different. All in all, VT is a better team than we showed, but UVA is the real deal. I still don’t understand why UVa gets away with a body check on the ball handler on every drive – if this were soccer the player in possession would get a free kick (maybe if the player flopped like in soccer they would get a call). It’s tough to beat a team that is THAT good when they’re ALSO just plain ON. I didn’t think that the VT defense was bad in the first half. UVA just made every halfway decent look. No, the defense was awful in the first half and marginally better in the second. We were slow. Help and rotation was very poor. Energy lacked. The difference in defensive energy from the GT game to this game was incredibly noticeable. Not sure if our defensive plan for the game was poor or if it was poorly executed but we did not have what is needed to compete against a team like UVA.